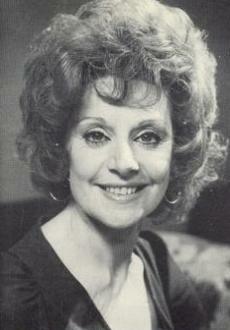 Barbara first appeared in one episode as exotic dancer Rita Littlewood in 1964, returning in 1972 as Rita Bates, common-law-wife of violent Harry Bates, who looked after his two children, Terry and Gail. After a short break she returned and has been playing the former cabaret singer ever since. Rita has been married three times in her 81 years. First, in April 1977 after a long on-off courtship with Len Fairclough, owner of The Kabin, the newsagent he installed her as manager in. They fostered two children in 1982, John Spencer and Sharon Gaskill. She was widowed on the night of the Ogden's ruby wedding anniversary party in December 1983 when Len was killed in a car crash on his way home from seeing another woman. She retired from showbusiness afterwards, vowing never to sing publicly again. Then in June 1992, after a whirlwind courtship, she married retired sweet salesman Ted Sullivan. That marriage was short-lived as Ted was dying from a brain tumour which took his life three months later. She turned down proposals from Fred Elliott and her business partner Norris Cole in her time as well as breaking and engagement to her former agent, Alec Gilroy. In April 2009 she was heartbroken after accepting one from Colin Grimshaw, Eileen's father, then minutes later discovering he had got Eileen's friend Paul pregnant when she was just 14 so broke the engagement. Colin subsequently died. On the 4th June 2012, she married Dennis Tanner after he reappeared the previous year. Like many of her relationships, there was to be no happy ending. First of all he went off with Gloria Price in 2014 after she stirred things between them. After Gloria dumped him, she ended up in hospital after sleeping rough and Rita eventually agreed to give it another go but slowly so they wouldn't be living together. However, Dennis was a schemer and planned to get Rita to take him back properly by having his niece, Julie Grimshaw, throw him out after a row so Rita took him back, stressing it was only one night. Norris found out and told her. After Dennis later punched Norris in the face, Rita walked into the shop as he was taking some money, told him to put it back and get out. Rita nearly lost her own life twice. In March 1989, after a volatile 3-year relationship, she discovered Alan Bradley, the man she lived with, had defrauded her. When confronted, he tried to kill her. His daughter Jenny and her friend Martin Platt returned but Alan fled leaving Rita fir dead. He was subsequently released from prison and began to stalk her, which drove her to a breakdown and she disappeared. He was killed by a Blackpool tram while chasing her that December after he'd been told where she was by Alec Gilroy. 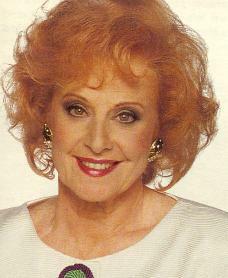 This particular storyline, which ran for 18 months, won Barbara numerous new fans and several well-deserved awards. Then in July 1998 Rita was overcome with carbon monoxide fumes from a badly installed gas fire. Again she was saved in the nick of time. More heartache during the new millennium when first she had been accused of assaulting young Chesney Brown in January 2004, resulting in a night in the cells for contempt of court as she defended herself against the farce. This was followed two years later when she foolishly agreed to help Fred Elliott by taking in con woman Stacey which ended up with her flat being wrecked and being threatened by a man looking for Stacey. Rita's not had the easiest of lives over the years with her numerous troubled and failed relationships with men and her friends. But like so many of the Street's women, she is a survivor. Barbara Brothwood came into the world on the 30th September 1933 in Oldham Lancashire. Her mother worked in the mill while her father was a moulder at Platt's Foundry then a fireman. She left school at 15 and worked as a telegraphist in the Post Office, learning shorthand, typing and had to pass Civil Service exams. She also worked in offices, shops and a factory. During this time she took part in amateur theatre until Carl Paulson, who ran Oldham Rep, asked her to appear in The Boyfriend, which was her professional stage debut. But she wasn't paid a penny for some considerable time during her 12 year spell learning her craft. She continued with various successful stage work and later appeared in many popular programmes of the day such as Never Mind the Quality, Feel the Width, George and the Dragon and A Family at War, as well as doing a stint in Emergency: Ward 10. She also had a small role as a dancer in the 1969 musical remake of Goodbye, Mr Chips and did anything needed from announcer to stooge alongside several of the UK's top comedians for BBC radio's Comedy Half Hour. Since taking the part of Rita Bates/Littlewood, Barbara has given two different reasons over more than thirty years for accepting the job, who told her to and why she had apparently retired. Originally it was she nearly died during an operation and retired before getting the call from Granada and her then husband told her to do it. Many years later it was she retired due to getting nowhere and her daughter told her to take the episodes. However William Russell told me in 2004 she was actually very successful in rep and took the job to see her daughter through law school. Whichever is the truth she did those couple of episodes and the rest, as they say, is history. 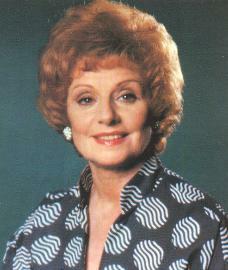 In 1989 she won the Oracle Teletext Best Actress award for her part in the Alan Bradley storyline. It was her first award, which she won again the following year, adding a TV Times one to them. 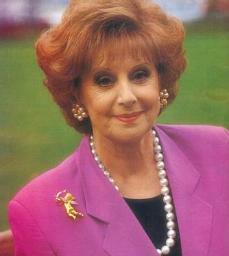 In 2004 she was given a Lifetime Achievement award at the British Soap Awards. Two years later she won Best Partnership with Malcolm Hebden. In 1992 she did a one-woman show at the Barbican Theatre in London. On the 12th April 2010, it was announced Barbara had been made an MBE in the Queen's Birthday Honours. A long time coming! Barbara has acted under two names - Mullaney and Knox. She is also a very talented singer, releasing an album in 1973 entitled, On The Street Where I Live. She changed it to Knox in 1977 after marrying John (they divorced in 1994), and has a daughter called Maxine from a previous marriage to Denis Mullany she raised single-handedly. Please click here to get her album released onto CD (as plugged on Paul O'Grady Live). We were told it would require 2000 signatures which we have passed and there's still no sign of an imminent release.